Pals battalions were a uniquely British phenomenon. Britain was the only major power not to begin the First World War with a mass conscripted army. After the war broke out, it quickly became clear that the small professional British Army was not large enough for a global conflict. In a wave of patriotic fervour, thousands of men volunteered for service in Lord Kitchener's New Armies. As part of this, it was realised that local ties could be harnessed for national gain. Many more men would enlist if they could serve alongside their friends, relatives and workmates. On 21 August 1914, the first Pals battalion began to be raised from the stockbrokers of the City of London. In a matter of days 1,600 men had joined what became the 10th Battalion, Royal Fusiliers. Lord Derby first coined the phrase 'battalion of pals' and recruited enough men to form three battalions of the King's (Liverpool) Regiment in only a week. Pals battalions became synonymous with the towns of northern Britain. Men from cities including Manchester, Leeds, Newcastle, Hull, Glasgow and Edinburgh all enlisted in their thousands in 1914 and 1915. But Pals battalions were also raised from Birmingham to Bristol and from Cambridge to Cardiff. After training, the first Pals battalions began to arrive on the Western Front from mid-1915. However, many of the Pals battalions were not to see their first major action until the first day of the Battle of the Somme on 1 July 1916. Many of these units sustained heavy casualties, which had a significant impact on their communities. With the introduction of conscription in 1916, the close-knit nature of the Pals battalions was never to be replicated. The recruitment of Pals battalions appealed to the complex local and national identities of men in Britain. Here the image of Field Marshal Sir John French, the Commander-in-Chief of the British Expeditionary Force, is used to appeal to men from Newcastle-upon-Tyne with Irish roots. Four 'Tyneside Irish' battalions were raised, as well as four 'Tyneside Scottish' battalions. Recruitment poster - 'Tyneside Irish Battalion. Irishmen To Arms'. 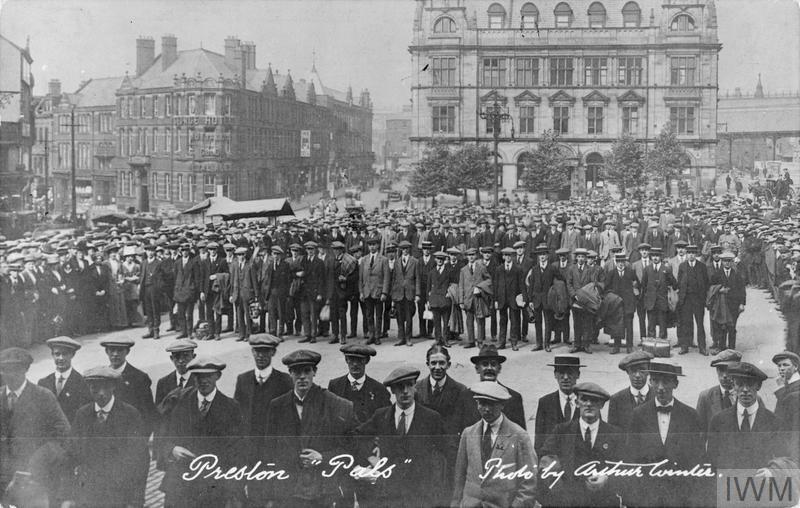 Volunteer recruits of the 'Preston Pals' parade in their civilian clothes in Market Square, Preston, on 7 September 1914. In two days, over 200 Preston men formed a company of the 7th Battalion, Loyal North Lancashire Regiment. They were joined by volunteers from Blackpool, Kirkham and Chorley. Volunteer recruits of the 'Preston Pals' parade in their civilian clothes in Market Square, Preston, on 7 September 1914. A group of 'Leeds Pals' at their training camp in the Yorkshire Dales in September 1914, shortly after enlisting. 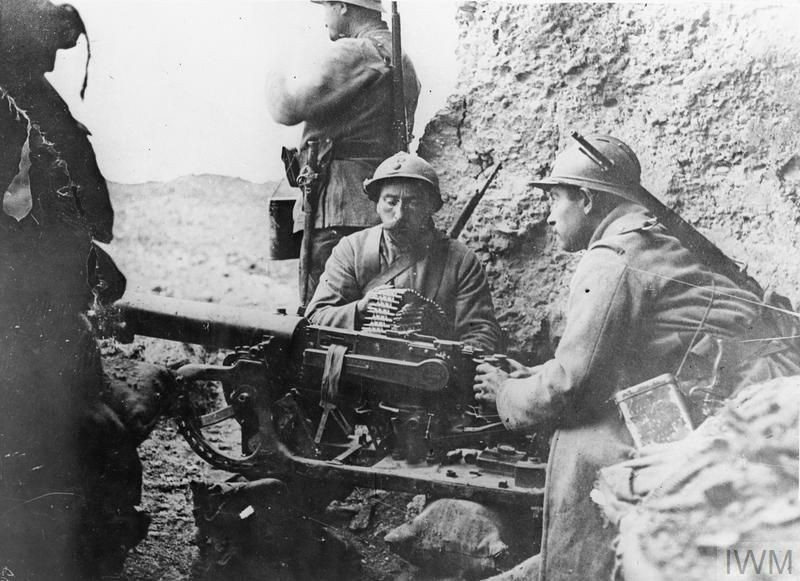 A local benefactor gave the men pipes, but their uniforms did not arrive until November - reflecting how quickly Pals battalions had been recruited. These men became part of the 15th Battalion, West Yorkshire Regiment. 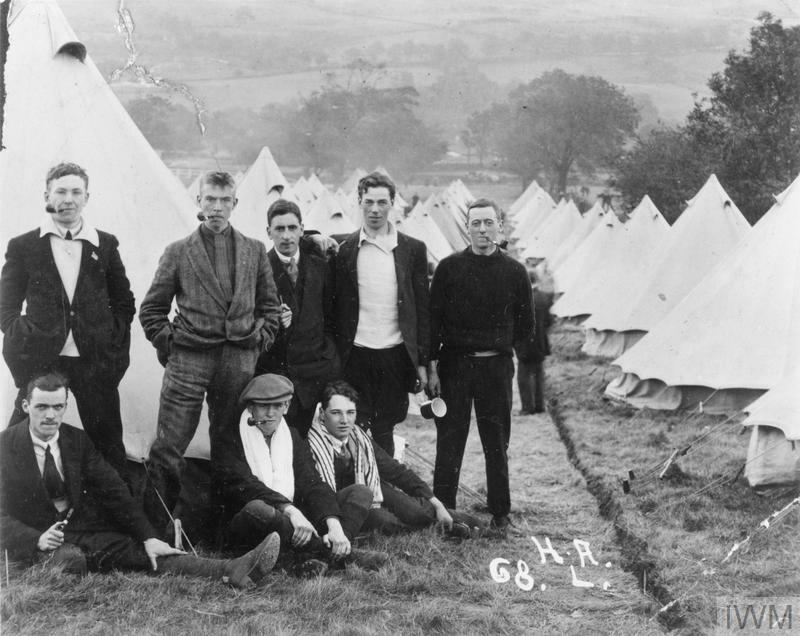 A group of 'Leeds Pals' at their training camp in the Yorkshire Dales in September 1914. 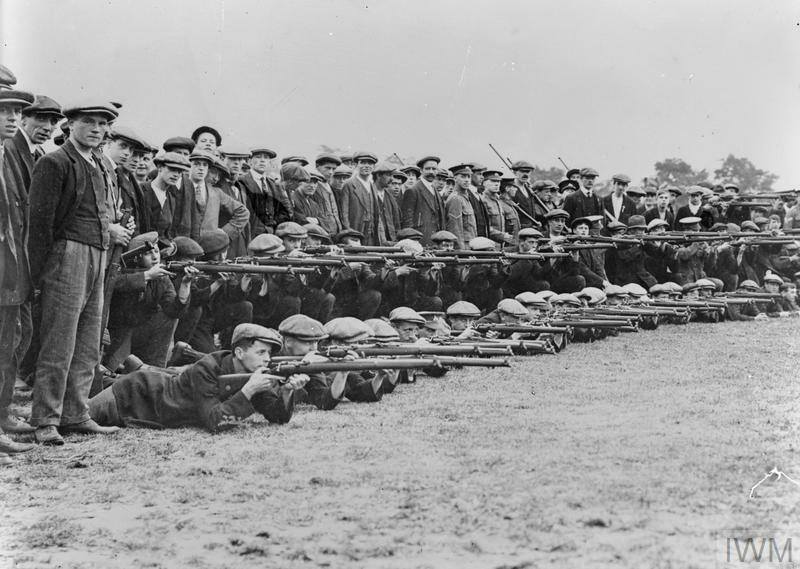 Recruits of the 'Grimsby Chums' (10th Battalion, Lincolnshire Regiment) pose with rifles, September 1914. Access to rifles so soon after joining up was rare due to the shortage of equipment, with new recruits often having to go without khaki uniform for several months. Unit lapel badge of 16th Battalion, West Yorkshire Regiment (1st Bradford Pals). This gilt and enamel badge was worn on civilian clothing before Army uniform was issued, partly as a result of the shortage of equipment. The battalion was raised by the Lord Mayor of Bradford in September 1914. Unit lapel badge of 16th Battalion, West Yorkshire Regiment (1st Bradford Pals). This headdress badge was given to men who volunteered for the first four City Pals battalions of the King's (Liverpool) Regiment before 16 October 1914. It was given as a personal gift from Lord Derby, who recruited these units. They became the 17th, 18th, 19th and 20th Battalions of the regiment. Headdress badge given to men who volunteered for the first four City Pals Battalions of the King's (Liverpool) Regiment. Infantrymen of 10th Battalion, East Yorkshire Regiment (Hull Commercials) marching near Doullens, 28 June 1916. While this photograph shows men of a Hull Pals battalion clearly having been encouraged to smile for the camera, it does reflect the sense of optimism among the troops of the British Army on the eve of the Battle of the Somme. Infantrymen of 10th Battalion, East Yorkshire Regiment (Hull Commercials) marching near Doullens, 28 June 1916. 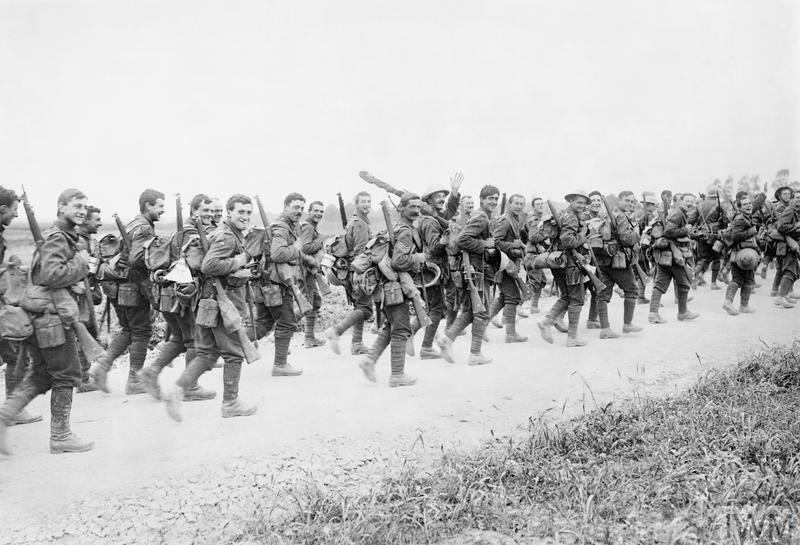 Men of a support company of an assault battalion of the Tyneside Irish Brigade moving forward shortly after zero hour on the first day of the Battle of the Somme, 1 July 1916. This significant day was when many Pals battalions experienced their first major attack. 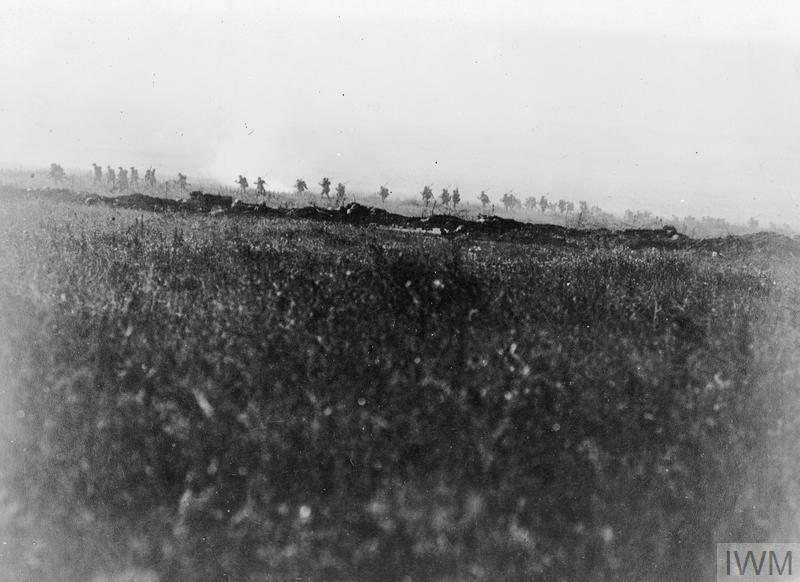 The Tyneside Irish attacked near La Boisselle, suffering very heavy casualties. This tin of cigarettes was among the personal belongings of Private Albert Tattersall, who died of wounds sustained on the first day of the Battle of the Somme. He was serving with the 20th Battalion, Manchester Regiment (5th City Pals). He had joined this Pals battalion along with his brothers John and Norman. 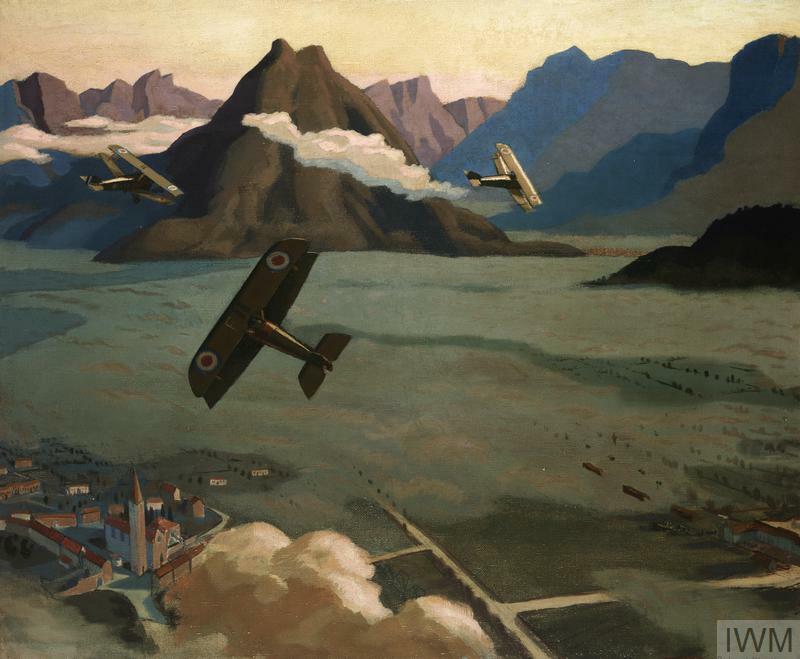 British Scouts leaving their Aerodrome on Patrol, over the Asiago Plateau, Italy, 1918, by Sydney Carline. The British vision of the First World War is dominated by the Western Front, but the war was fought on a wider scale. 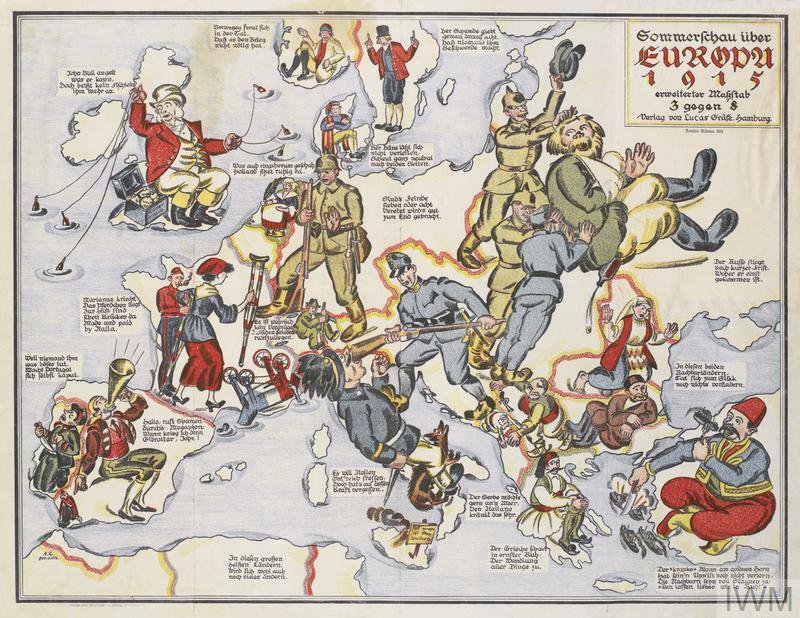 On the Eastern Front, Russia fought Germany and Austria-Hungary, generally failing against the former, but fatally weakening the latter before collapsing into revolution in 1917.